I'm not going to lie: When I first heard that Convening Leaders 2011 was going to overlap with the 2011 International Consumer Electronics Show, I wondered if it was the best idea. CES is the definition of a city-wide event, a 125,000-attendee giganotosaurus with exhibit space at the Las Vegas Convention Center, The Venetian, the Las Vegas Hilton, and the Renaissance Las Vegas Hotel, meetings and room blocks at a slew of other properties, and receptions and parties at who knows how many venues. Add in a certain other high-profile event happening at the same time — this one at the Sands Expo & Convention Center, with upwards of 25,000 attendees — and you have a recipe for meetings gridlock. Or so it seemed to me. 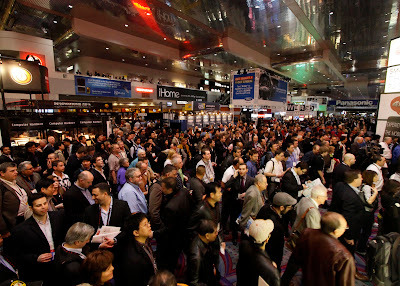 Initial reports from Senior Editor Hunter Slaton, who came out on Thursday to cover CES for Convene, weren’t encouraging; the day before, McCarran International Airport had set a record for the number of taxis loaded during a 24-hour period, and Hunter had a terrible time getting around the city. But when I landed yesterday morning and made my way to the MGM Grand for Convening Leaders, and as I’ve walked around the MGM Grand this morning, I’ve found a sense of excitement and fun, like something akin to Christmastime. I think that, as a huge show that Las Vegas is clearly proud to host every year, CES has a spillover effect on the city’s entire meetings infrastructure. It’s cool to be here and to be a part of it.